The Center for Women In Technology (CWIT) at the University of Maryland Baltimore County (UMBC) is a merit-based scholarship program for talented undergraduates majoring in computer science, information systems, business technology administration (with a technical focus), computer engineering, mechanical engineering, chemical/biochemical/environmental engineering, or a related program at UMBC. The Center for Women in Technology (CWIT, pronounced “see-wit”) is dedicated to increasing the representation of women in creating technology and in engineering and information technology fields. CWIT efforts begin with nurturing a strong group of Scholars, grow to building community resources for other women in these majors, extend to fostering a healthy gender climate and ITE pedagogy in College of Engineering and Information Technology (COEIT) departments, and finally expand into outreach efforts to increase interest in technical careers. A successful program for female-friendly engineering and information technology education at UMBC will help make UMBC a destination for women (and men) interested in technical careers and serve as a national model for other universities. CWIT Scholars receive four-year scholarships ranging from $5,000 – $15,000 per academic year for in-state students, and from $10,000 – $22,000 per academic year for out-of-state students, to cover full tuition, mandatory fees, and other expenses. Each CWIT Scholar participates in special courses and activities and receive mentoring from faculty and participating members of the IT and engineering communities. 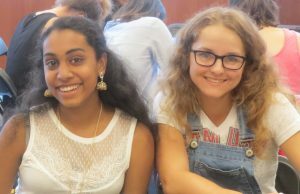 In addition to completing their chosen major, CWIT Scholars participate in a series of academic and extracurricular activities designed to foster a supportive community for women in IT and engineering. Monthly meetings with other CWIT Scholars, and various community-building social activities with peers. Graduates of the CWIT Scholars Program can expect to take a leadership role in the computing and engineering workforce to foster the continued growth of women in the field, or they may enroll in a premier graduate program to continue their studies in their area of interest. Graduates of the CWIT Scholars Program can expect to take a leadership role in the IT and engineering workforce to foster the continued growth of women in the field, or they may enroll in a premier graduate program to continue their studies in their area of interest. CWIT Alumni are employed in organizations such as Booz Allen Hamilton, General Electric, Lockheed Martin, NavAir, and Northrop Grumman; or are participating in Masters and Doctoral programs at The Johns Hopkins University, Northeastern University, UMBC, and the University of Pennsylvania. 90% of all CWIT Scholars have either graduated in 6-years or are still pursuing their studies in a IT or Engineering major. The average for all first-time full-time students entering UMBC since 1995 is approximately 60%. In Fall 2017, there were a total of 55 CWIT Scholars being supported by the CWIT program. 79% of the CWIT Scholars were women and 26% of Scholar are Black and Hispanic students. Candidates for the CWIT Scholars Program must complete a separate scholarship application. Two letters of recommendation are required: one from a science or technology teacher and one from someone familiar with the student’s academic work and leadership qualities. A faculty committee will interview finalists. For incoming freshmen in Fall 2019, the completed CWIT Scholars application and supporting documents must be submitted to the Scholarships Office by January 15. Applications are available from UMBC’s Office of Scholarships. Final award decisions will be announced no later than the end of March. To learn more about the CWIT Scholars Program, please contact Erica D’Eramo (410-455-8076; deramo@umbc.edu) or the UMBC Office of Financial Aid & Scholarships (410-455-3813; http://financialaid.umbc.edu/contact/).